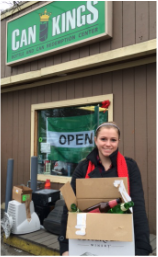 Another way to help generate funds for PFC is by dropping off your cans and bottles at Can Kings in Fairport. They make cashing in bottles easy- they do all of the work for you. Just hand them your bottles and name the Pittsford Food Cupboard as the account you want credited. For more information on Can Kings, see their website at www.cankings.com. a group to distribute it to.